University of California Press, 9780520261990, 280pp. Intrepid international explorer, biologist, and photographer Mark W. Moffett, "the Indiana Jones of entomology," takes us around the globe on a strange and colorful journey in search of the hidden world of ants. In tales from Nigeria, Indonesia, the Amazon, Australia, California, and elsewhere, Moffett recounts his entomological exploits and provides fascinating details on how ants live and how they dominate their ecosystems through strikingly human behaviors, yet at a different scale and a faster tempo. Moffett's spectacular close-up photographs shrink us down to size, so that we can observe ants in familiar roles; warriors, builders, big-game hunters, and slave owners. We find them creating marketplaces and assembly lines and dealing with issues we think of as uniquely human--including hygiene, recycling, and warfare. 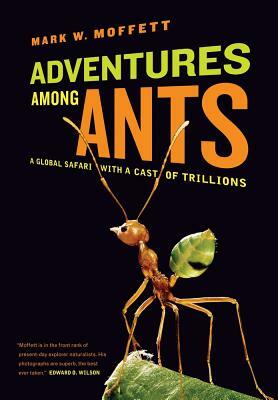 Adventures among Ants introduces some of the world's most awe-inspiring species and offers a startling new perspective on the limits of our own perception. - Some ants have evolved from hunter-gatherers into farmers, domesticating other insects and growing crops for food. Mark W. Moffett, Research Associate at the Smithsonian Institution, is the author of The High Frontier: Exploring the Tropical Rainforest Canopy and Face to Face with Frogs. Moffett has received the Explorers Club's Lowell Thomas Award, the Distinguished Explorer Award from the Roy Chapman Andrews Society, Yale University's Poynter Fellowship for Journalism, Harvard's Bowdoin Prize for writing, and many international photography awards.